Kristin Ann Fahlbusch scrutinized Karen Albert’s face so she could decide which shade of lipstick would look best on her. Karen already had a little bit of bling going on with her glasses and her earrings. She wasn’t looking for anything too outlandish on her lips, just something to give her a little color. Kristin chose a natural shade and went to work. The past four years haven’t been easy for Karen. She was diagnosed with inflammatory breast cancer in 2013 and went through chemo, a double mastectomy, and radiation therapy. Fourteen months later, the cancer was back — this time in her liver. She’s now on her third clinical trial and travels to Boston several times a month to get a combination of chemo and immunotherapy. What Karen needed was a little pampering, from an angel maybe. An angel like Kristin Ann, which is actually what she is. Kristin Ann represents a non-profit organization called Lipstick Angels. It was founded by celebrity makeup artist Renata Helfman in 2012. 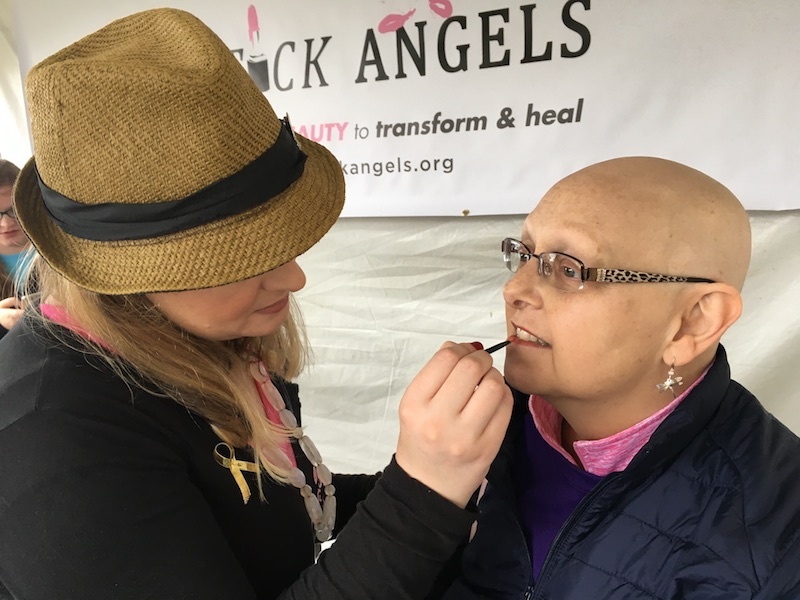 Makeup professionals like Kristin Ann go to the bedside or the infusion center at participating hospitals and try to bring a little love and beauty to patients having cancer treatments. The program is currently in four hospitals, three in California and one in New York City. Kristin Ann manages the New York program. 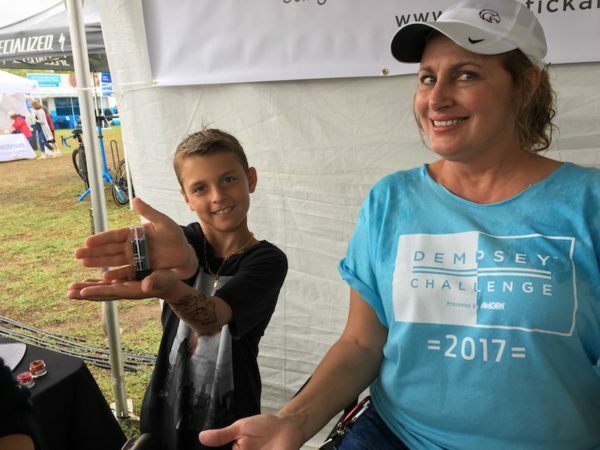 I met Karen and Kristin Ann at the ninth annual Dempsey Challenge in Lewiston, Maine. 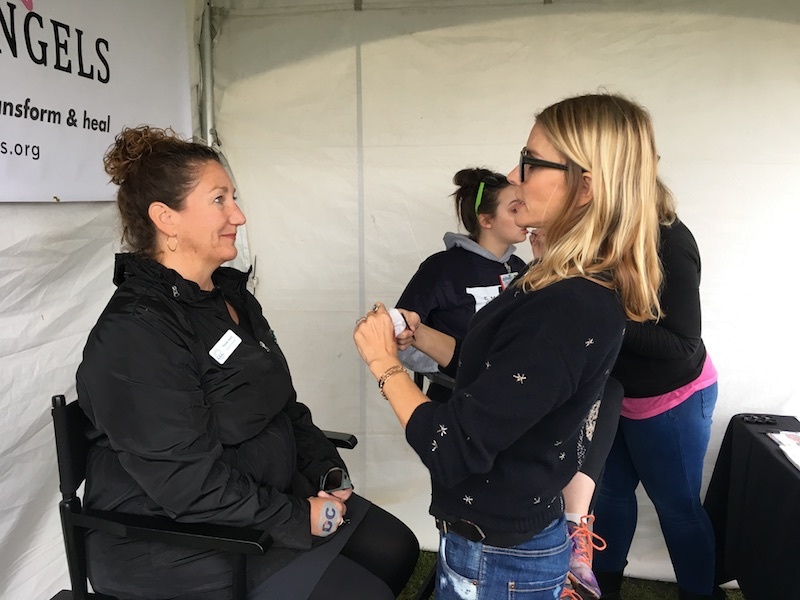 The two-day bike and running event was created by actor Patrick Dempsey, whose roots are in Maine, to raise money for the Dempsey Center. The Center, which is also in Lewiston, provides free support and a multitude of services for people dealing with cancer. The inspiration for the center came from Patrick’s late mother Amanda Dempsey, who lived with ovarian cancer for more than 17 years before her death in 2014. 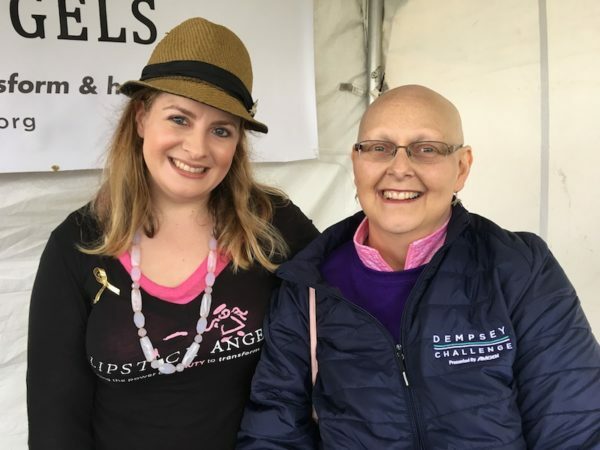 Lipstick Angels had a tent at the Dempsey Challenge where Kristin Ann worked alongside Patrick’s wife Jillian Dempsey. Together, they pampered hundreds of women by choosing just the right lip color and giving them complimentary tubes of lipstick. 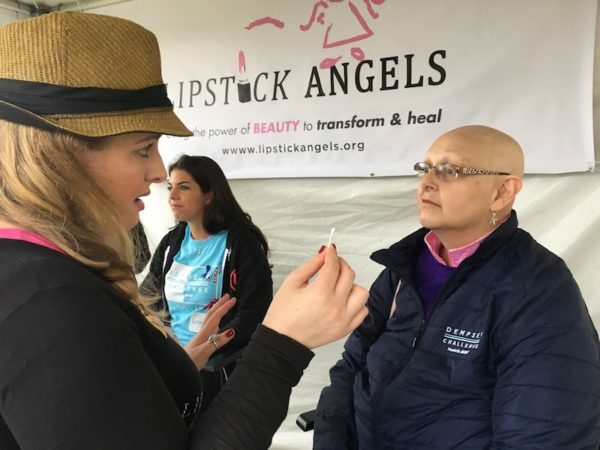 Jillian, who is also a professional celebrity make up artist with her own line of makeup, collaborated with Lipstick Angels to design six lipstick colors specifically for the Challenge. Unfortunately, Talula was sick and couldn’t make the event. On the bright side, her brother Sullivan (whose twin brother Darby was off riding his bike with his dad) good-naturedly took her place and was kept busy handing out the lipsticks. 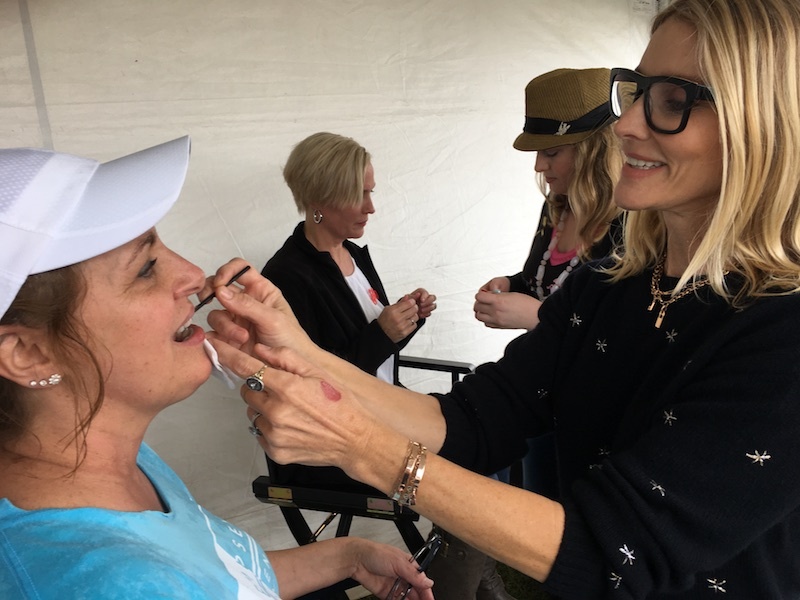 Unlike Karen, a lot of the women who stood in line for a lipstick consultation with Jillian and Kristin Ann did not have cancer. Still, they had all been touched by cancer in some way. Nicole Avery, for instance, is the Executive Director of the Cancer Community Center in South Portland, Maine. 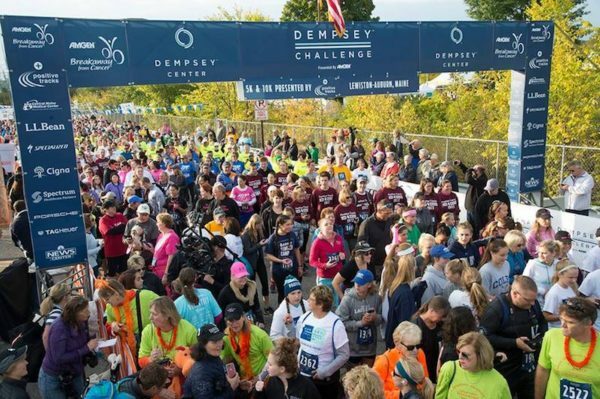 Like the Dempsey Center, it also provides free support and a multitude of services and programs for people dealing with cancer. A few months ago, the two organizations announced they will be merging under the Dempsey Center name. The goal is to have Dempsey Centers scattered throughout the state of Maine. The need for love and support is everywhere. Which is why Lipstick Angels would like to expand its services, too.